Investigators have taken a DNA sample from the wife of slain suspect Tamerlan Tsarnaev to compare with the female DNA discovered on the pressure cooker from one of the Boston bombs. The FBI is also examining whether Tamerlan Tsarnaev met with two men in Dagestan who are considered radical Muslims. NBC's Pete Williams reports. Prosecutors and lawyers for surviving Boston Marathon bombing suspect Dzhokhar Tsarnaev have begun very early discussions about a possible deal, in which he would cooperate in exchange for avoiding the death penalty, legal sources said Monday. As details of the nascent negotiations emerged, a lawyer who has helped other high-profile suspects cut deals that kept them out of the execution chamber got permission to join Tsarnaev's defense team. Attorney Judy Clarke's past clients have included Unabomber Ted Kaczynski and, more recently, Jared Loughner, who was spared facing the death penalty for the Tucson, Ariz., shooting that nearly killed former U.S. Rep. Gabby Giffords in 2011. Tsarnaev, 19, is charged with using a weapon of mass destruction for the April 15 bombing that killed three and wounded 176 in Boston and could face the death penalty. The suspect's older brother and accused accomplice, Tamerlan Tsarnaev, 26, was killed in a firefight with police, and investigators are trying to determine if anyone else was involved. Law enforcement officials said they took a DNA sample Monday from Tamerlan's wife, Katherine Russell Tsarnaev, to compare to female DNA found on a piece of pressure cooker used to make one of the bombs. The wife has said she had no inkling of her husband's plans, and officials cautioned that the DNA on the cooker could have come from a worker at the store where it was purchased. 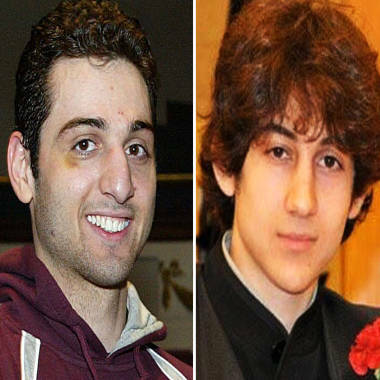 Boston bombing suspects Tamerlan (left) and Dzhokhar Tsarnaev. The FBI is also looking into whether the older brother met with two men considered radical Muslims during a 2012 trip to the Russian republic of Dagestan. Both men — William Plotnikov and Makmud Nidal — were killed last year in Russian operations. The spotlight has also been trained on the Tsarnaevs' mother, Zubeidat, who was caught on a Russian wiretap talking to Tamerlan about jihad, U.S. officials said. That conversation led the Russians to ask the FBI to look into Tamerlan in 2011. He and his mother were put into a U.S. terrorism database, but no further action was taken. While some members of Congress have faulted the Russians for not giving the U.S. more explicit details about the mother, officials in Washington said she spoke so generally about jihad that it's not likely the information would have influenced the outcome of the 2011 probe. Before he was given a Miranda warning and stopped talking, Dzhokhar Tsarnaev told investigators that he and his brother were motivated by religion but acted alone, without help from any overseas terrorist organization. But law enforcement officials believe someone may have carried items out of his dorm room at the University of Massachusetts-Dartmouth a few days after the bombings and they searched local landfills for them. So far nothing has turned up, but investigators are still looking in garbage containers. Three federal public defenders were appointed to represent Tsarnaev, and they asked that two death penalty specialists be added to the team. The court approved Clarke but said the request for a second lawyer, David Bruck of the Washington and Lee University School of Law, was premature since Tsarnaev has not been indicted yet. Wounded by police during his capture,Tsarnaev was transferred last week from a private Boston hospital to a federal medical prison in central Massachusetts.